Ever wondered what it would be like if your mother was in your class? Ryou Kisaragi does. 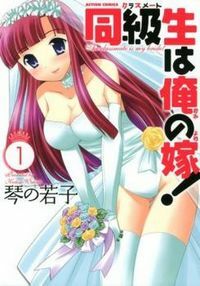 Actually the mother to be is none other than his classmate Imai Yuka: a girl who he saw naked in his house one morning, and who is father is remarrying. Now he must juggle his desire for his soon to be step-mother and his love for his girlfriend! WHO WILL WIN OUT! -from baka-updates: "About a high school guy who finds out that his new step mother is none other than a classmate from his school."